I’ve been married for 23 years. Aside from my winning personality and my wife’s infinite patience and tolerance, there is one reason why this is so. I’m not nearly as fickle about women as I am about fountain pens. Once I found a wife that would tolerate me, even my cooking, I held on for dear life. Not so my choice of fountain pens. I’m new to journal sketching but not to fountain pens. I’ve been using the later since high school, long enough ago that events of the time are showing up in history books. But I’ve only been sketching for three months. When I started my favorite pen for sketching was the Lamy Safari. Inexpensive, more reliable than any other, and you can get it in a variety of colors for color-coding the inks you’re using. Since October, however, I’ve purchased a Kaweco All-Sport, a really fine, tiny (short word for great portable sketch kit pen) reliable line-producer. Not quite as fine a line as the Lamy but still a great pen. Then I chased the notion of a “flex pen.” I had nothing but trouble with my standard Noodler’s flex and while I’ve also had a few glitches with my Noodler’s Ahab, it’s a pretty nice sketching pen as well. I have a hard time getting as thin a line as I’d like, however. And so my quest continued. At each of these junctures I returned to my Lamy but I was determined to find a fountain pen that would draw as fine a line as a Pigma Micron 01. I avoid disposable pens; there are simply too many billions of them floating in the Atlantic for me to want to add to the pile. And so it was when I sent off a paltry sum for a Pilot 78G. In fact, I bought two of them because they were so cheap. When they arrived I was impressed. The 78G produces a very fine line – just what I was after. Using either Noodler’s Lexington Gray (my favorite waterproof sketching ink) or Platinum Carbon Black, the Pilot 78G writes very dry. I wouldn’t say it skips on me as that wouldn’t be true, but it sure feels like it’s about to when I use it, particularly if I start cross-hatching. The 78G is also an opaque body pen so I can’t see how much ink you’ve got which is a problem for me as I want to take itto do field sketching. It doesn’t come with a converter so you have to add $6-7 to the price to get one (The Con-50 fits it). I found the cap threads to be sloppy and some have reported the cap coming off. Mine have certainly loosened on their own. And so it was that I decided to bite the bullet and send my $50+ to Goulet Pens for a Pilot Prelude. Of the pens I’ve mentioned, this is the most expensive. And now that I’ve had it for a couple days I feel it’s worth the price. Most say that the nib on the 78G and the Prera are the same. I sure can’t see a visible difference except that the 78G is gold-plated. But when I put them to paper, my Prera is much smoother than my 78Gs. I leave it to pen experts to debate such things, though. The Prera is much more solid in my hand than the 78G, which feels like the ultra-cheap pen that it is. Some say the Prera is ‘too small’ but I’m a pretty big guy and find that with the cap posted, it feels very good in my hands. I bought one of the “demonstrator” models to get a clear pen body, though Pilot is wise in coloring both ends of these pens so some ability to color-code multiple pens is still a possibility. The Prera comes with a converter so there’s no extra purchase necessary. At this point I’ve only put Noodler’s Lexington Gray through it and the Prera likes it just fine, whether I’m writing on Clairfontaine paper or drawing on watercolor paper. It’s my new favorite pen. 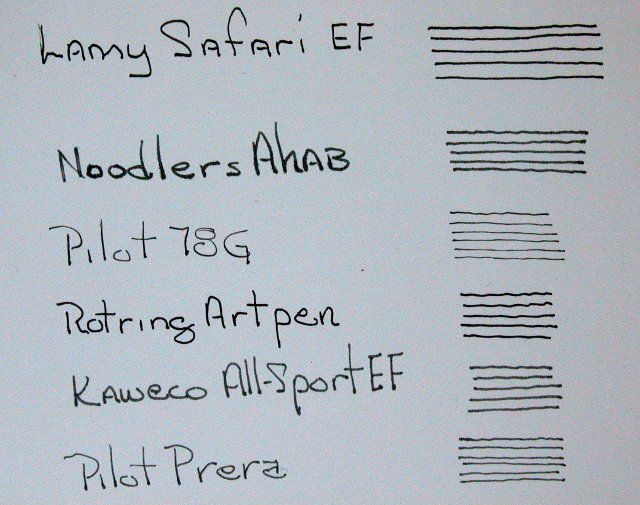 So if you’re looking for a truly ‘fine’ line you could do worse than to look at Pilot pens. A price comparison between the Prera and 78G favors the 78G but the price you pay for cheap is significant in my opinion. Prera: $55 (clear models) from Goulet Pens and doing business with Rachel and Brian is priceless. Larry, it sounds to me like you have the same taste in drawing pens as I have so I will take your advice seriously. I too dislike the thought of adding to the plastic island and have a Lamy Safari and a Noodler’s Flex but I haven’t been won over by them yet. My favourites for drawing remain disposable pens – Pilot G-Tec-C4 0., Faber-Castell Ecco Pigment 0.3, and xs, s, m Pitt pens in black. I will now put the Prera on my wish list. Thanks for the great info. As an aside to those reading my blog, I highly recommend Ruca’s Dog-eared Journals blog (http://dog-earedjournals.blogspot.com/). He’s much better at wielding a pen than I am. Awesome analysis. great pics of the Prera. That’s a fabulous looking pen. I’m glad you have (so far) found a pen “just right” for you. Thanks for all your comments and helpful information on my post over at Artists’ Journal Workshop Facebook page. I think you’ve influenced me regarding using refillable pens, I am definitely setting myself up with those (I now have 3 Preppys and a Platinum Carbon pen, a bottle of Lex. Gray ink and a bottle of Platinum Carbon on its way). I agree, Preppys are pretty great, and I love my Carbon pen too! It’s good to see you here, Stacy. I just counted. On my desk, right now, are 11 fountain pens, a couple Sharpies, a Pentel brush pen and several mechanical and wooden pencils. And then there’s the drawer…err drawers 🙂 I have a fountain pen fetish. Preppies are still the best bang for the buck. I rarely use them for drawing but at least one of them is with me at all times. I grab for one to do editing, as well, as I have a red one converted to an eyedropper pen, which gives me nearly unlimited ink capacity. I think the Platinum Carbon is a good choice. I really like my Rotring Art Pen which is the same sort of pen. I use it if I want to sketch with a washable ink as it’s loaded with a washable black. But, if I had it to do over again I would buy the Platinum Carbon because it looks so cool. As I said, I have a fountain pen fetish. Where did you buy your bottle of Platinum Black? Platinum seems to be very stingy with this ink and most places are back ordered. If you could drop me a quick note at larry@larrydmarshall.com, I’d appreciate it. I really like the ink, though you have to work harder to keep your pens functioning if you use it. But it’s clearly the only true waterproof black other than inks that are completely unfriendly towards fountain pens. Great review, Larry! Love the look of the Prera. I don’t need another pen, but posts like this make me THINK I do! 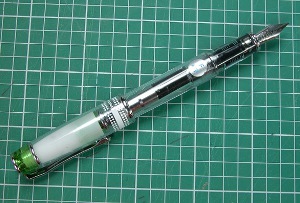 Another alternative to consider is the Copic refillable pen system. 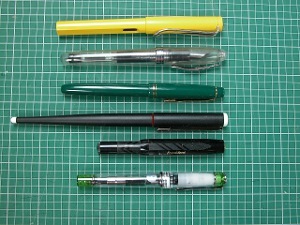 The pens and nibs are very similar to the Microns with the exception that they can be refilled, nibs replaced etc. The ink is black (and they have other colors as well) and very waterproof on most papers. Some require a bit more drying time than others. When I travel and know that I want something absolutely reliable, I take one of my Copics. I don’t feel that I’m contributing to the wasteland out there and I’m going to be happy with the pen. Thanks for stopping by, Laure. When I heard about the Copic pens I had high hopes. 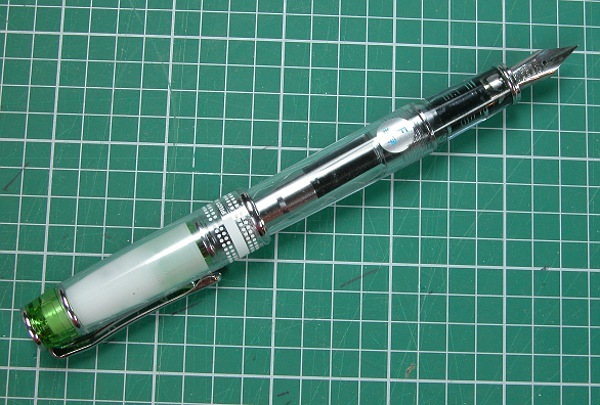 I bought two of them and they do work well – very similar to Microns in my view, but in a nicer package. When it comes to non-biodegradable plastic, however, they were a disappointment. If they’d gone to a liquid ink system they would be but the replacement cartridges are nearly the same amount of plastic as a Micron pen so I see no advantage there. Glad you like yours, though. Nice review! 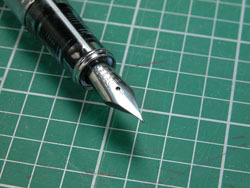 I am also a big fan of Lamy fountain pens. 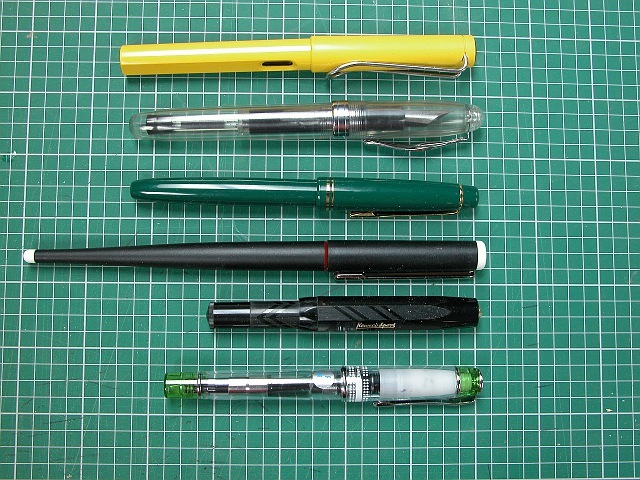 And the Kaweco is in my wish list. 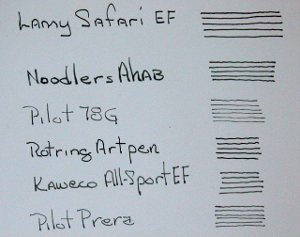 I’ll add also the Pilot Prera to the list. If you like a Lamy Fine you’ll probably like a Kaweco fine. To be honest, I was susprised by how well the Kaweco wrote. I’ve got to post it to use it, though. This brings it to the length of an unposted Lamy. The one downside is that you have to use short cartridges in it. I don’t find this a problem as I just fill them with a syringe and so use Noodler’s in mine. Others might not like that. I love my Rotring pen except that it’s too long to be a carry-around pen. The Prera can offer a finer line but unless that’s what you desire, there’s probably little reason to switch from the Rotring.